Okay. We've had a couple of days to recover from the epic fail that was the announcement of the Best Film Academy Award on Sunday evening. I've read (yes, and made) countless tweets and think pieces about how better design could have prevented this catastrophe—one even went so far as to redesign the cards. While I agree, I'm not going to waste time with my own take on this already-over-discussed topic, and instead use this as an opportunity to give everyone a refresher on something we all sometimes take for granted: The basic principles of design (and here you thought they were just lyrics from Sunday in the Park with George). Everything you design, from a comment card in a check drop to an animated billboard in Times Square, begins with a finite amount of space and time for you to work within. What you do with that space, and how you interpret these principles, will determine the efficacy of your design to achieve its desired outcome. I've listed some below with some two (okay, like, six) cents of my own. Making sure all elements within your design are distributed equally—though not necessarily symmetrically—throughout the space they live in. I don't want to be standing near your poster and feel as though it's about to topple over on me from being so top-heavy. 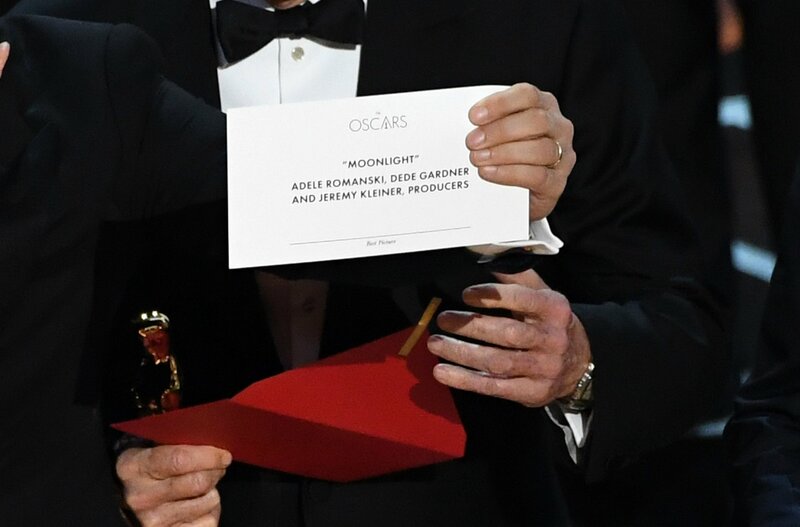 This is where the Oscars fell apart. Understanding the hierarchy of information on a given design is 90% of the work. Once you determine what is primarily important, secondarily important, and so on, the basic layout of anything you design will pretty much unfold itself for you. Working in tandem with other tenets on this list, the scale and proportion of the elements of your design should help all elements achieve a harmonious whole, indicate the decided-upon hierarchy of information, as well as be appropriate for the amount of space you're working within. Another place the Oscars failed. Hard. When all the information in a design is the same size, weight, alignment, etc., nothing is more important than anything else. Using variety in these methods to indicate hierarchy is essential. And, as the title of this post suggests, NOT all information is created equal, no matter how precious it might be to you. It's important to remind ourselves of these basic items from time to time, because the only real effective way to break the rules is to know them to begin with!